Hurricane Irma and subsequent winter storms in late 2017 and early 2018 brough severe shoreline erosion to parts of Sarasota County, Fla. Along Casey Key, the erosion became dire when it exposed a public water main and caused a 12-ft-high bluff within 2 ft of Casey Key Road. Sarasota County Public Works faced a time crunch, as Casey Key Road is the only means of vehicular transportation onto Casey Key, on top of environmental regulations requiring use of non-permanent stabilization methods. Typically, Sarasota County would place beach compatible sand that would erode over time and require a replacement, but this failing roadway required a more substantial solution. 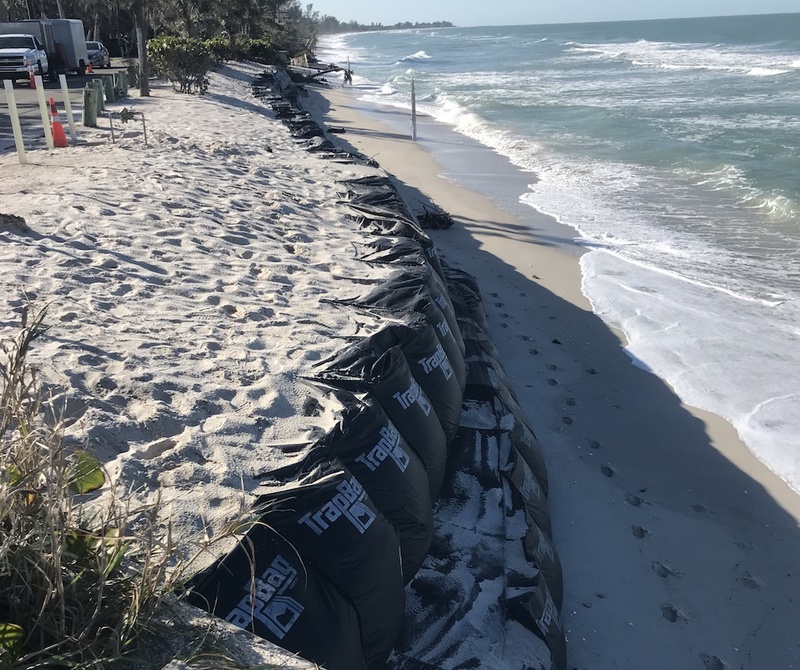 County staff chose to utilize a cellular barrier bag called TrapBag to protect 300 ln ft of shoreline from severe erosion by creating a soft armoring system of sandbags. The project quickly came together with multiple groups successfully collaborating. On March 28, when it came time for installation, county staff had to quickly adapt because the county had never used this product before, while combating difficult weather conditions. Overall, the project was completed in less than two weeks with the road reopening to traffic April 5. Through hard work and teamwork, the county overcame challenges, including transporting equipment and more than 100 cu yards of sand on a narrow roadway, environmental permitting with local and state agencies, working with a new product on a timeline and more. Designers: Sarasota County Public Works, Taylor Eng. Inc.